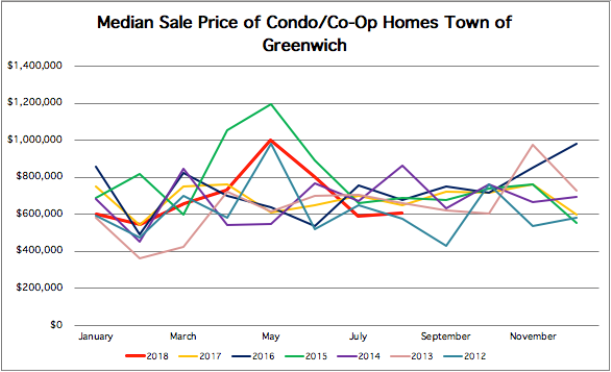 September 20, 2018 (Greenwich, CT) – The Greenwich Association of REALTORS® announces the statistics for home sales in The Town of Greenwich, CT for the month of August 2018. There were 61 single-family residential closings reported during this period according to figures provided by The Greenwich Multiple Listing Service, Inc., the multiple listing service used by REALTORS® in the Greenwich area. The number of single-family residential closings increased, compared to August 2017 when there were 57 closings in August. The median sale price for a single-family home decreased to $1,800,000 from $1,994,450 the median sales price in August 2017. The average days on the market (DOM) for residential homes was 158 days; which was an increase from 146 days in August 2017. There were 22 condo/co-op residential closings reported during this time period; which was a decrease from August 2017 when there were 25 closings. The median sale price for a condo/co-op decreased to $607,250 from $650,000 the median sales price in August 2017. The average days on the market (DOM) for condo/co-op residential homes was 156; which was an increase from 106 days in August 2017. “August 2018 finished the Summer off with a seven percent sales increase! There were sixty-one sales in August 2018, from fifty-seven last year. 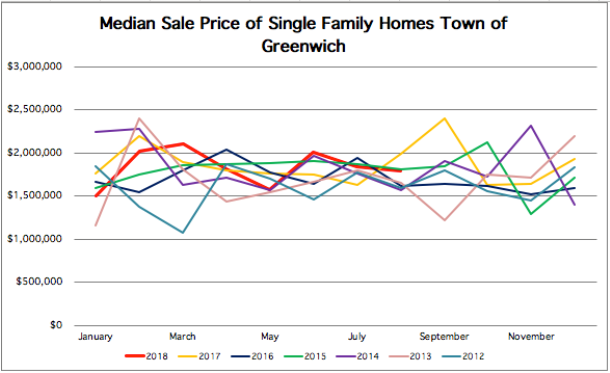 Greenwich remains consistent as the area in town with the most closings, ending August with forty sales; Greenwich had a twenty-one percent increase from August 2018. Condo/Co-Op sales had twenty-two closings, with a median sale price of $607,250; These numbers are inline with the past years closings. Pending sales as of 8:30am this morning for Single Family homes were forty-three and eighteen for Condo/Co-Op. Similar to July, August was another active month. We were fortunate to close out the Summer market on a positive note. As the Fall market has begun, it is likely that we will continue to have an active market for the next upcoming months”, stated BK Bates, 2018 President of the Greenwich Association of REALTORS®.